SPLICEDwire | "Snow Dogs" review (2002) Brian Levant, Cuba Gooding Jr.
Might not hold a parent's attention on the small screen, but the kids will still get a kick out of it. Thankfully, the talking pooches basking on beach recliners in the TV commercials for Disney's Iditarod comedy "Snow Dogs" are only from a dream sequence, and not some ill-advised CGI gimmick around which a movie was built. 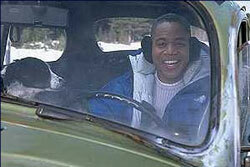 The real gimmick -- a Miami dentist (Cuba Gooding, Jr.) inherits a sled dog team and becomes determined to learn the ropes of mushing -- isn't much more plausible. But "Snow Dogs" has a contagious sense of humor and a great spirit that go a long way toward turning the predictable plot into entertaining family fare. Gooding provides plenty of choice comedic double-takes and ice-induced pratfalls as he shivers his way through a story that includes mischievous sled dogs, assorted friendly Yukon ruffians, a pretty, sparky Eskimo love interest (Joanna Bacalso) and the Disney-traditional long-lost father. The fact that Gooding's gruff, weather-beaten birth pop (he was adopted by his Miami parents) is played by James Coburn demonstrates one of the ways in which director Brian Levant ("The Flintstones," "Jingle All the Way") takes "Snow Dogs" in unexpected directions within it's cookie-cutter story structure. Having a white father "explains why you're so crazy about Michael Bolton," cracks Nichelle Nichols as Gooding's Miami mom. Further evidence of Levant's formula tweaking comes by way of a self-mocking cameo by Bolton in the same dream as the talking dogs. An instant "I'll show him!" animosity between father and son is what stiffens Gooding's city slicker resolve to stay in Alaska, leading to lots of sled wipe-outs down snowy mountainsides and other frostbitten antics that culminate in a blizzard-bound rescue during the climactic dog race. Levant could have and should have trimmed a couple extraneous scenes that drag out the movie's run time, and "Snow Dogs" does suffer from elementary execution and ham-fisted scripting. For instance, the Eskimo girl keeps showing up, randomly and without reason, whenever she's needed to advance the plot -- even if Gooding has hiked to the top of a mountain by himself. But frequent flurries of creative belly laughs and genuinely enthusiastic performances from Gooding and Coburn keep the movie slaloming through its hackneyed elements with enjoyable ease.